It’s the kind of backward, old-fashioned comment one can imagine a little girl getting in the midst of a 1950s elementary school math competition. But Nilanjana Datta, now a noted Univ. Of Cambridge quantum information theorist, says she was in her 20s and an ETH Zurich grad student when someone said that to her. And it happened in the 1990s. 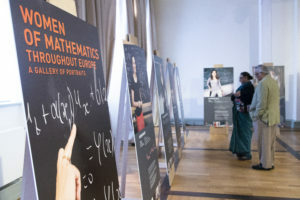 Gender bias in mathematics isn’t always so explicit but it is nonetheless an ugly reality, say organizers of Women in Mathematics Throughout Europe, a traveling photo exhibition in Heidelberg this week on occasion of the sixth annual Heidelberg Laureate Forum (HLF 2018). The exhibit features 13 women mathematicians who’ve made great contributions to the field and whose success may inspire girls and women to follow in their steps. The creation of the exhibit grew “from the observation that, nowadays, women still find it difficult to embrace a career in the mathematical academic world and (that) the disparity between the proportion of men and that of women among professional mathematicians is still shamefully large,” according to the organizers. In the interviews and portraits displayed here, it is a common theme. But while that feeling of duty was critical then, it is the joy she derives from math that continues to drive her. “The moment I enjoy best is when the pieces of the puzzle fall into a coherent whole,” she said. So many of the mathematicians interviewed for the exhibit echoed that sentiment. It’s worth noting that the featured mathematicians do revolve depending on the venue — Datta, for instance, was included in the Univ. of Cambridge version of the exhibit earlier this year. 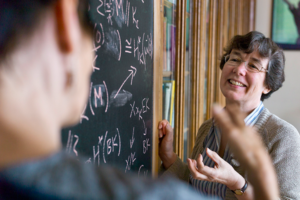 Here’s a list of the mathematicians honored here this week with links to their research and work. Now the Savilian professor of geometry at the Univ. of Oxford, Dame Frances specializes in algebraic and symplectic geometry. It’s paid off. She’s perhaps best known for her creation of the so-called Kirwan map, or for her role as the president of the London Mathematical Society (2004-06), the second-youngest in the society’s long history. In 2013, she won that society’s coveted Senior White House prize and was named Dame Commander of the British Empire for her contributions to mathematics a year later. The winner of the Henri Poincaré Prize in 2012 for her work, with Freeman Dyson, Barry Simon and Sylvia Serfati, on quantum chaos and dynamical systems work, Anantharaman chairs the mathematics department at the Univ. of Strasbourg. A professor of mathematics and informatics at Bulgaria’s Veliko Tarnovo University. Stefka’s research centers on algebra, coding theory, combinatronics, error correction and other various aspects of cryptography. 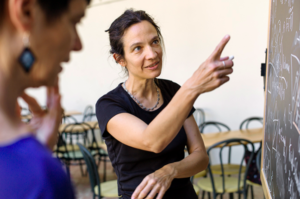 Functional analysis, deformation, representation, cohomology and Lie theory are among the long list of research interests of Fialowsky, a native Hungarian who these days performs her research at the University of Pécs, Eötvös Loránd University. As an academic research fellow in the department of math and statistics at the Univ. of Turku in Finland, Matomäki specializes in number theory, including multiplicative number theory, prime numbers and additive combinatorics. In 2016, she and Maksym Radziwill were awarded the SASTRA Ramanujan Prize, which honors young mathematicians who work in areas pioneered or influenced by famed mathematician Srinivasa Ramanujan. At the University of Lisbon, Portugal, Medes Lopes focuses on algebraic geometry, particularly as it relates to the classification of projective varieties, surfaces of general type and bicanonical maps. Watch her lecture on the behavior of curves on irregular surfaces here. Baur chiefly focuses her energies on cluster algebras, surface algebras and combinatorial methods in representation theory. Find a selection of her research work at the University of Graz here. Perišic is a mathematics professor at the Univ. of Novi Sad in Serbia, where she researches problems involving functional analysis and generalized function theories. Find a sampling of her research papers here. 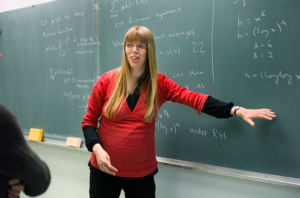 On the faculty of mathematics and natural sciences at the Humboldt University of Berlin, Kmit focuses most on mathematical analysis regarding hyperbolic differential equations, boundary value problems, bifurcation as well as stability analysis. Nelli is a native Italian who conducts research in such fields as differential geometry, geometric analysis and geometrical problems involving constant mean curvature surfaces. She is a professor in the department of engineering, information sciences and mathematics at the Univ. of L’Aquila. Originally from Poland, Rejzner primarily delves into mathematical physics, operator algebras, algebraic quantum field theory and renormalization at the Univ. of York. Find a selection of her papers and other work here. Specializing in geometry and quantum field theory, Wendland is a mathematical physicist at the University of Freiburg. In 2009, the Bavarian government awarded her its Medal for Special Merits for her work in mathematics. Yakimova primarily specializes in algebraic groups, Lie algebras, Poisson structures and harmonic analysis on Gelfand pairs. Check out a sampling of her research work here. For HLF 2018 in Heidelberg, Germany, I’m Gina Smith. 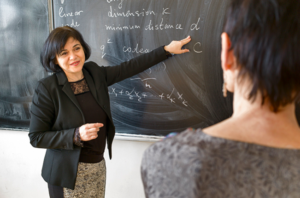 Gina’s post HLF 2018: Women in Mathematics Throughout Europe, An Exhibition is also available on Heidelberg Laureate Forum.